The move away from the gothic style also resulted from a series of Parliamentary acts, passed from 1529 to 1536, in which England broke from the Catholic Church, establishing the King as supreme ruler over the religious authority in England and the Anglican Church as the official Church of England. This break allowed more land to be given over to secular use and the structures built on the land to be less influenced by the Catholic Church’s gothic-style tradition. The use of coal as a fuel also influenced the Tudor style, as the thick smoke emitted by the burning fuel led to the incorporation of chimneys into the design of many buildings. The Tudor architectural movement derives its name from the reign of Tudor monarchs who ruled England from 1485 to 1603. The Tudors gained power when Henry, son of Edmond Tudor, killed Richard III of the House of York and assumed the throne as Henry VII. Henry’s son, King Henry VIII, broke with the Catholic Church in order to divorce his wife, Catherine of Aragon, because she did not provide him with a male heir. All told, Henry VIII divorced two of his six wives and beheaded another two in his efforts to have a male child. Henry VIII did have a son, Edward VI, who ruled after his father’s death in 1547. Edward made the Anglican Church more Protestant but was dominated by the English nobility while in power. After Edward’s death in 1553, the English people rallied behind Mary I, a catholic, in place of Edward’s heir, Lady Jane Grey. Queen Mary I tightened her grip on the throne by restoring Papal supremacy in England and reinstating heresy laws that resulted in the burning of over 300 Protestants at the stake. These actions made Mary unpopular, as did her decision to marry King Phillip of Spain in 1556, a political maneuver that had virtually no positive consequences for England. After Mary’s death in 1558, the throne fell to her half-sister Elizabeth, who became one of the most noted English leaders in history. Not wanting to surrender her right to the throne by taking a husband, Elizabeth never married, earning the nickname of “Virgin Queen.” Elizabeth was able to peacefully bring the country back to Protestantism. Her greatest victory came with the defeat of the Spanish Armada in 1587, an attack provoked by her execution of Mary Queen of Scots, a catholic who posed a threat to Elizabeth’s throne. The catholic nation of Spain was angered and sent one of the biggest fleets in history to attack England. The portion of the Armada that made it to England was quickly defeated, and England replaced Spain as the world’s greatest naval power. Tudor Park is one of five separate parcels acquired and mapped as parkland along North Conduit Avenue, between the years 1915 and 1974. It is located between 80th and 88th Streets in southern Queens just west of JFK Airport and Aqueduct Racetrack. Despite the fact that only one piece of land goes by the name of Tudor Park, the entire area was given the name by Commissioner Stern in 1987. The earliest area of the park was transferred for park purposes from the Department of Water Supply, Gas & Electricity when it was deemed unnecessary for the North/Brooklyn Conduit. 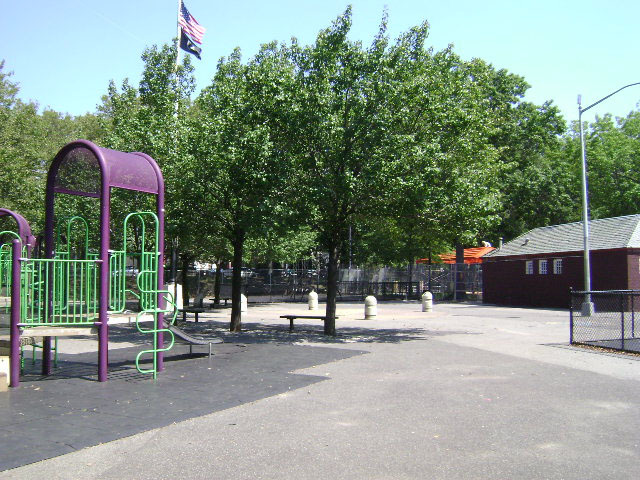 Today, residents of Queens use this portion of Tudor Park for games of football and softball.